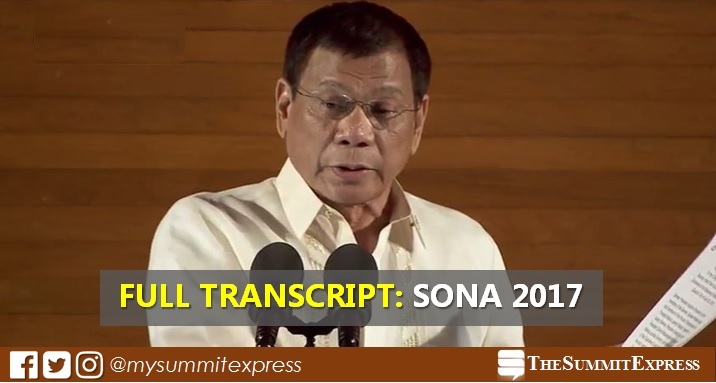 MANILA, Philippines - (UPDATED) Known as "President's Report to the People", the full text and transcript in English of the 2017 State of the Nation Address (SONA) of President Rodrigo Roa Duterte, is available online shortly after he has spoken on Monday, July 24, in front of 3,000 guests at the Plenary Hall of the Batasang Pambansa Complex in Quezon City. The traditional ceremony started at 3:30 p.m. (arrival) with President Duterte's second SONA speech delivery at 4:20 p.m. The speech was drafted in English and due to some off-the-cuff remarks, the president finished delivery at 6:26 in the evening. With the theme "A Comfortable Life for All", the speech resonates better with more Filipinos. This theme is supported by the Administration’s three key agenda—prosperity for all, law and order, and peace—which categorize the positive changes felt by the people. As advised, printed copies of the same report will be distributed to selected schools, embassies, government offices, and other institutions following the event. The Presidential Communications Operations Office (PCOO) has assigned sign language interpreter for those with auditory impairment. Spanish, French, German, Russian, Chinese, and Japanese interpreters will also be provided for the diplomats present during the event. An English translator is on standby to interpret the President's vernacular lines for attending foreign dignitaries. Here is the full text of Duterte's speech, as provided by the Malacañang. Duterte delivered it in English, punctuated by ad-libs in Filipino and a bit of Bisaya. When I took my oath of office a year or so ago, I knew that our country was reeling from a multitude of problems. That day, there was euphoria in the air resulting from a successful campaign and the thought that dominated my being was to make good on my promise to the people to bring [about change] --- change in government, not a change that is passing but a change that can survive the test of time. For as I saw it then as I see it now, there is no problem in the world which can stop the march of a people with unflinching and tenacious determination. That was how euphoric --- euphoric it has been. But don’t get me wrong. I value human life the way I value mine. Each life that is snuffed out translates into future generations lost. It is like cracking the acorn from which an oak tree grows - which, in turn, produce the seeds to complete the cycle of [life in] perpetuity. Ganito ‘yan eh. Medyo alis muna ako diyan sa… Sasakit ang mata ko diyan sa y*** na ‘yan. [laughter] Alam mo, you have the mining. I have to grant you a mining because you have complied with all the requirements of the law. And I cannot… I’d be subject to a mandamus if everything is perfect and you have every right to mine. But in doing so, you destroy the rivers, you destroy the streams, from which the poor people fish – halwan or mudfish --- and that is protein for the day for them. You must remember that there are so many billions of the future generations waiting in this stratosphere. Ang gusto ninyo para hindi na kayo mandamay, huminto na kayo ng ano. Then let us go to… Because this will not end here. How about the billions and billions and billions of Filipinos who will come after us? Kawawa naman. They’ll have to scratch Mother Earth to eat. By this time kung walang upheaval, no regeneration will occur, we are almost like talagang ginaganun natin ang – maliit na lang ang makuha nila. But maawa naman kayo. Makikita mo ‘yung apo mo kung ganun mo na lang… Kung ganun mo na lang ‘yung --- embrace mo ‘yung apo mo sa pangalawang asawa. ‘Yung isa ganun rin. ‘Di ba? ‘Di ba, sir? [laughter] Suntukin kita diyan ngayon, liar ka. To our employees and officials of the LGUs tasked with monitoring these mining operations within their territorial jurisdictions, do your job without fear or favor. I [hold] you absolutely responsible for any misdeed or failure [by] the mining entities to comply --- do not comply or comply with the guidelines, rules and regulations governing mining operations and activities within your area of responsibility. I mean it. Do not try to test my resolve. Absolutely I have nothing to lose except my life. Alam ba ninyo ’yan? Because you do not publish. Or itong mga taga-Maynila… Hindi kayo, mga bright kayo, bilib ako. Mga g****g****. Sabi na “Why do you…?” Why? What happened last April in Davao? It was bombed. How many were killed? Twenty-seven. Few years ago, the church was bombed twice. How many died? Fifty-nine. The airport just as the people were coming out of the departure – ah arrival – it was bombed. How many died? Thirty-two. In the war, three nuns were lining up there. I had to scoop the brain of the nun to put it in a can because the face was shattered. Zamboanga. And you say that the violation is only in Marawi? Torpe. Talaga kayong… Mag-usap tayo ngayon. Dalhin ko kayo doon sa mga biyuda. Kailan lang ’yun? Maraming Muslim sa Mindanao. Lahat… Eh sa Abra, meron eh. In this fight… Well, where do you think the Moro would side? Kung patayan na. They will side with government? Kung ako ngayon, kung nakatira ako, hindi kami umalis ng – hindi ako dinala ng nanay ko sa labas. I’ll be a resident of Marawi, what do you think will be my sentiment? Sulu. Davao, puro Muslim enclaves ‘yan, there are enclaves, parang baryo-baryo. Kapag sentimiyento ang putukan, magputok ‘yan sabay-sabay. Time and again, iyong pag-transact ng ordinary...no, no the ordinary people who transact business in government. In the last ASEAN Ministerial conference, I don’t know why Malacanan has to---my office has to do some work for—or the orders like itong mga barong. It’s always the—that outfit takes care of the attire that will be given to the ministerial, this time to the heads of state. Ganito iyan, two things, wala na talaga akong panahon. I don’t know if I can make another SONA again in the future. It’s not for me to tell that. Itong TRO has been the vain of projects and even Consunji, iyong mga Ayala nag-aaway iyan. Just to make you understand na hindi lang kayo. Tapos iyang TRO na iyan, would delay the projects. Now God... and I am asking Congress find me a law na kung may bidding naman at it was regular, dapat ang korte or somebody else should not be messing it up because it will delay the projects which has been the case in the provinces. Alam mo mag-file iyan ng kaso, either it is really the truth, well the COA will found out or makahati siya. I will withdraw the case and dissolve the TRO of course, then you just give me a few...sabihin mo 10%. Ganoon ang ugali ng Pilipino. Kaya iyang TRO na iyan is the vain of our efficiency. And I really do not know whether—I will not attribute anything, Ma’am, sa Supreme Court. Maybe I am at fault, so I am sorry, if I misquote or I did not have the complete facts. The vain isa pa –itong…the Congress and tayo sa gobyerno including the judges and justices, should understand that by this time, iyong lowest bid iyon ang nagpo-promote ng graft and corruption sa ating bayan. [applause] COA, you are here at malaman na lang ninyo na may violation ako. Doon sa military I do not allow them to bid but just to buy the weapons from everywhere. Because almost all countries are making arms, the tawag nila - small arms industry. We are just fighting a rebellion. True, we do not need the armaments, but diyan sa Marawi you have to hit hard because they are pre-positioned inside buildings. And until now we cannot proceed fast because there are 300 hostages. Alam mo, si Ma’am Grace... You are pushing for---you know, when I became President, EDSA was already horrendous as it was a horror of the other administrations. Now, I brought in Tugade, because Tugade is to me, a bright boy. He is a billionaire; he was my classmate, ewan ko nandito siya. He was our valedictorian in the law class, talagang mahusay. But we needed money and we tried to get your help to raise money. Eh ayaw naman ninyong ibigay, di hanggang ngayon, andiyan pa iyong EDSA.